Residents cover their faces as they cross the street at Second Avenue and East 70th Street on Thursday. The dust and odor fills the air when the MTA blasts underground for the subway. 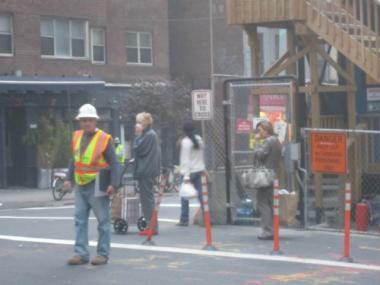 MANHATTAN — Residents living near drilling and blasting for the Second Avenue subway are worried that the construction is harming their health. People have complained about developing coughs, and claimed they have to cover their faces when walking through the streets and keep their windows closed for part of the day. In response to these concerns, the MTA hired the firm Parsons Brinckerhoff to conduct an air-quality study, collecting minute-by-minute data for various pollutants — including fine particulate matter, sulfur dioxide and silica — at 10 locations between East 69th and 87th streets during a four-week period starting Sept. 12, 2011. The study said that most measured pollutants were below national air quality and industry standards. When there were spikes in some types of pollution, however, they weren't triggered by subway blasting, but by traffic and residential buildings' dirty boilers, the report said. For instance, high concentrations of one type of particulate matter were "primarily attributed to local traffic emissions, other local sources such as commercial and residential boilers, and regional or background levels, with no significant contribution from blasting activities," the report stated. Another type of particulate matter did spike during the 3 p.m. to 7 p.m. blasting period, but the concentrations were still below acceptable benchmarks to indicate no "adverse" health effects, the study showed. "Based on the results of the study, there are no concerns that Second Avenue Subway construction is causing any danger to the public’s health," MTA Capital Construction President Michael Horodniceanu said in a statement Thursday. "We will continue to do everything we can to be a good neighbor as we complete this critically important project as quickly as possible." The MTA will present the findings, which were reviewed by the Environmental Protection Agency, to Community Board 8's Second Avenue Subway Task Force on Jan. 26. The study's investigators found that people living immediately adjacent to the project's giant, boxy "muck houses" — designed to minimize dust from the dirt workers have dug up for the subway at East 70th and 72nd streets — were most impacted by odors. In interviews conducted with residents, the investigators heard people describe the smell as acrid, smoky and skunk-like. One woman, who lives on Second Avenue and East 69th Street, said it smelled like a "plastic, chemical odor" and that she occasionally "felt a tingling and burning sensation on her lips" because of it. A man who lives on Second Avenue and East 72nd Street likened the "sulfury" smell to gunpowder and said, "It hits the back of the throat." "From this data, it appears that the blasting is having some impact on increased odors in the area," the report stated. But, it added, "There are no chronic or acute health problems associated with the odor thresholds." In early December — two months after the monitoring period ended — the MTA made some changes to the muck houses in response to community complaints. The agency purchased two new "Dust Bosses" that spray a water mist to force the dust particles to settle within the structures. The transit agency also installed a wet burlap curtain in the shafts to act as a screening device for dust, and permanently sealed some overhangs and installed vents elsewhere. It also added more time between dynamiting to allow for dust and smoke to dissipate. "These measures have been successful in reducing the visible smoke and odors at the street level," the report said. Many residents agreed that the changes have made a big difference. "It's like night and day," said Lynne Cashman, who has lived on East 71st Street and Second Avenue for nearly 40 years. "The question is, why didn't they do this in the beginning." She also said that the MTA began sending daily emails to residents about blasting schedules. "They're trying very hard to make us happy." The MTA will present its findings at Community Board 8's Subway Task Force meeting on Thursday, Jan. 26 at 6:30 p.m. at Hunter College, 695 Park Ave., West Bldg., Lecture Hall, Rm 714 W.